I have to tell you all that I am really excited to be co-hosting with the incredible Liz from A Belle, a Bean, & a Chicago Dog for #BlogBoycottDay! During the last #BlogBoycottDay Liz said that she was ready to give it up and asked if anyone was interested in taking it over! I quickly raised my hand and here I am! So what is #BlogBoycottDay you ask? Well, it’s a day dedicated to social media! Spend your day Tweeting and engaging with your community instead of writing posts for your blog or reading and commenting on others. Reach out to all those people who you haven’t spoken with in a while or that one person you’ve always wanted to talk to. 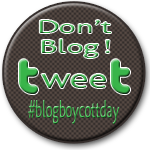 #BlogBoycottDay is the 2nd Friday every month and all you have to do is link up!